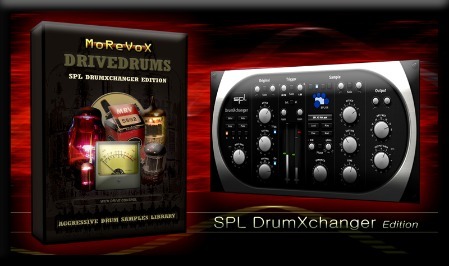 DriveDrums: SPL DrumXchanger Edition Drum Sample Library, Virtual Drum/Percussion from Morevox. MoReVoX DriveDrums has been developed by generating distortion through different kind of devices: Vacum Tubes, Analog Tapes, Preamps have been used to create samples with various types of distorsion. MoReVoX DriveDrums is said to contain rich and fat natural acoustic sounds. All samples have been tested on mixes and optimized for retriggering and stand-alone use. The samples have been divided into two categories: Drive Samples and Over Samples. The Drive Samples have been developed starting from the classic hardware harmonic distortion, so all the samples contain a smoother distortion character (Tape compression warmth, subtle valve saturation). The Over Samples instead are based on distortion; the samples have been developed finding their character in conjunction with the hardware distortion (Valve/Console Preamps, Analog Tape Saturation, Heavy Valve Compression, Dedicated distortion outboard). MoReVoX DriveDrums contains 30 Kicks, 30 Snares, 8 Toms Racks, 30 Cymbals and more for a total of 1600 Samples. The Drive Control works in the frequency range 500Hz - 3Khz. In the company's words: "It adds definition, Rich and Warm tube sound with sweet distortion. It increases the "in your face" sound’s perception." Available for Digital Download for $99.00. 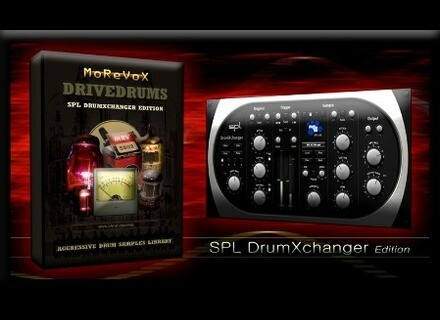 For more info go to www.morevox.com/drivedrums. iZotope - Mac OS X 10.6 Patch iZotope recently learned that under certain circumstances, installing an iZotope product or demo and then applying any Mac OS X 10.6 update can cause some computers to experience problems booting. Apple iPad Coming Up in Europe Almost two months after its official US release, Europe is next: iPad will be available in France, Germany, Italy, Spain, Switzerland and the UK on Friday, May 28. Prime Loops XXL Dance Effects Prime Loops announced this collection of cutting edge sound effects and one-shot samples for your music productions.